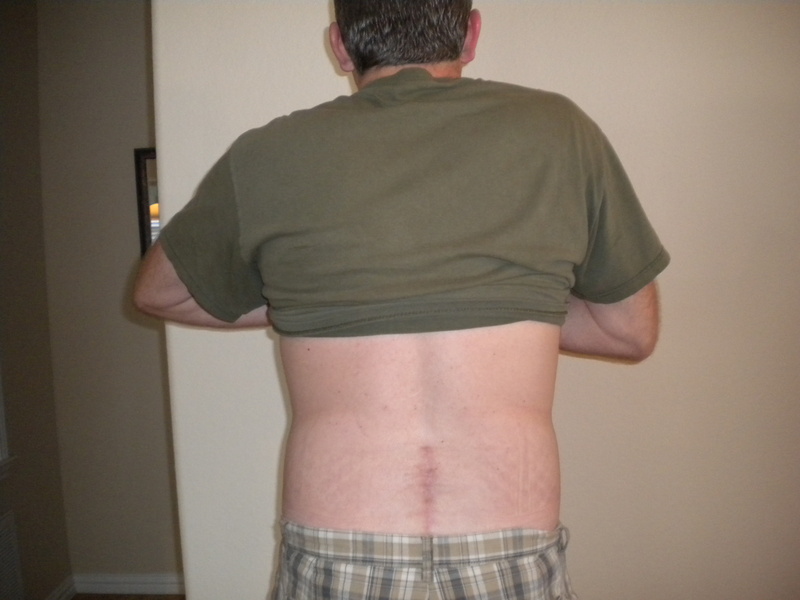 Week 24 – Photo of L4 L5 Fusion Scar after 5 months, Still putting on my brace! | God has your back! 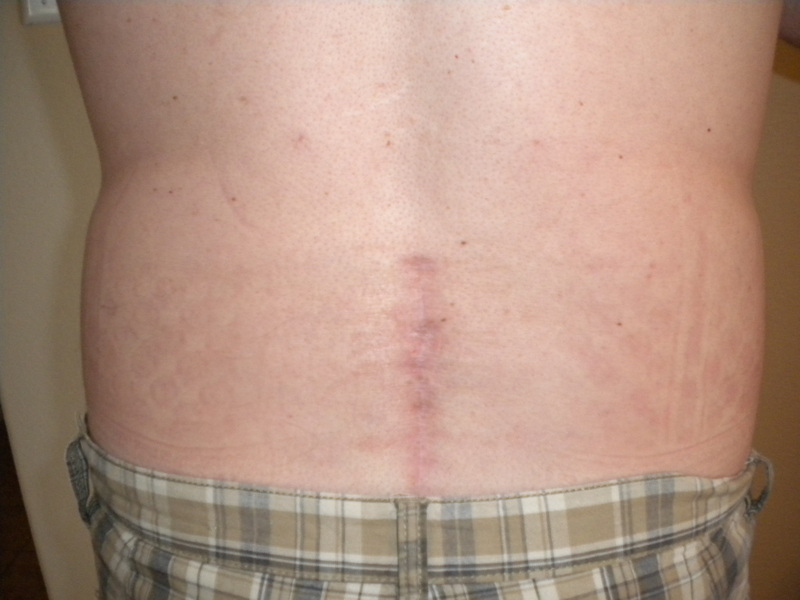 Week 24 – Photo of L4 L5 Fusion Scar after 5 months, Still putting on my brace! My recovery is still going very well. 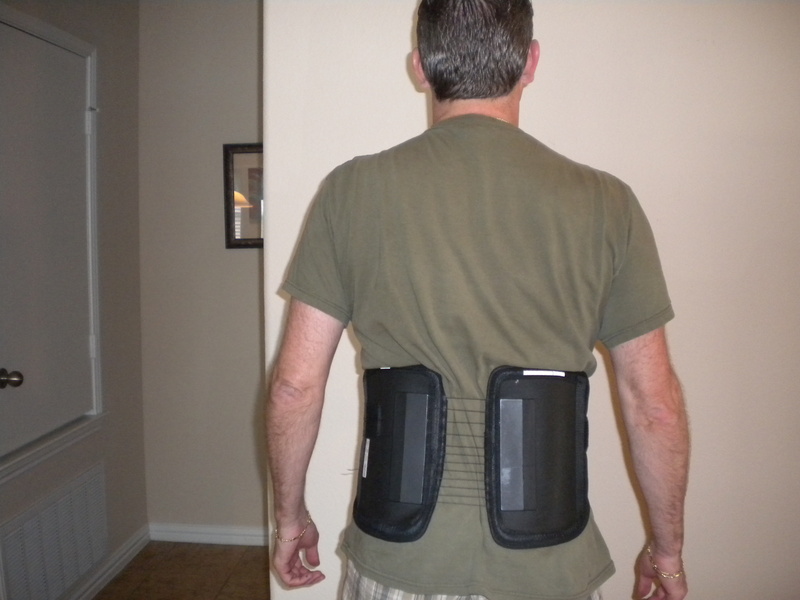 It has been approximately 5 and a half months since my back surgery and I feel great. I don’t think I took any pain meds past the third week. I would have to go back and check the blog to know the exact day for sure, but to borrow a phrase from Mr. James Brown, “I feeeel good! Hah!” Below is a photo of the scar from the incision from the surgery. If you look close you can see the criss-cross pattern from the modified brace I have been wearing since month # 3. The brace has been modified because I was able to remove the big plastic plates at my three month check up. That helped with the heat factor and also with the comfort level when I sit in certain chairs but alas it does leave that interesting pattern on one’s back. The pattern kind of looks like a Belgian waffle. But I figure waffles go along rather nicely with the muffin top I have developed from not running for the last 24 weeks. I am looking forward to the day when I get released to run, lift weights, pick up grandbabies and do all the things I did before my surgery which includes not wearing a brace. At first, I was not used to putting the brace on every morning but now it has become almost second nature. It has simply become one of those things that I now do instinctively as a part of my routine every day. I am as unlikely to leave home without putting it on as I would be my socks or my shoes. Well, there was that one day that I was in a hurry and I got dressed and rushed out of the door and jumped in the car before I noticed I wasn’t wearing it. I was two blocks away before I noticed that something just didn’t feel right! I am afraid that too many times I have indeed run out of the door without praying and asking the Lord to help me put on the compassion, kindness and humility that I need to get through the day. And on those days I have made it much further than two blocks from home before I noticed that something didn’t feel right. I have made it through the entire day and through entire conversations with others where I was insensitive, unkind and sometimes downright rude to people. Yes, I went much further than two blocks before I realized that I had left the house without being fully prepared, supported and dressed for my day. I am much better at it now than I was years ago, but every now and then I still get in a hurry and run out of the door without the divine support that I need to stand tall and strong in this world. I have tried to make it a part of my routine to stop and pray before I leave the driveway and ask the Lord to help me and to make sure that I am fully clothed in His humility, His gentleness and His patience and His love – before I leave the driveway. And that is a good practice to have, especially with Austin traffic. If you would like to know more about a personal relationship with Jesus Christ, you can send me an email directly at pastorpstephens@aol.com. This entry was posted in back surgery, faith, God, inspirational and tagged back surgery, faith, God, inspirational. Bookmark the permalink.